Susan is a plant dyer with over ten years experience growing three of the Medieval Grand Teint: madder, weld and woad. 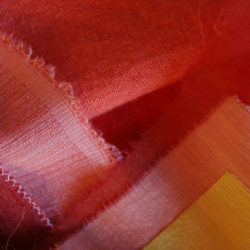 She uses systematic experiments to explore and refine dye recipes for use on fibre, yarn and cloth. Susan has a City and Guilds Certificate in craft and design and uses plant dyed materials in contemporary stitched textiles. She is a member of the North Herts and London Guilds of Weavers Spinners and Dyers. Growing dyeplants, natural dyeing. Offers 1-1 tuition and small commissions.